The average university student spends over $1,000 a year on textbooks. If you are interested in exploring viable alternatives, this workshop is for you. 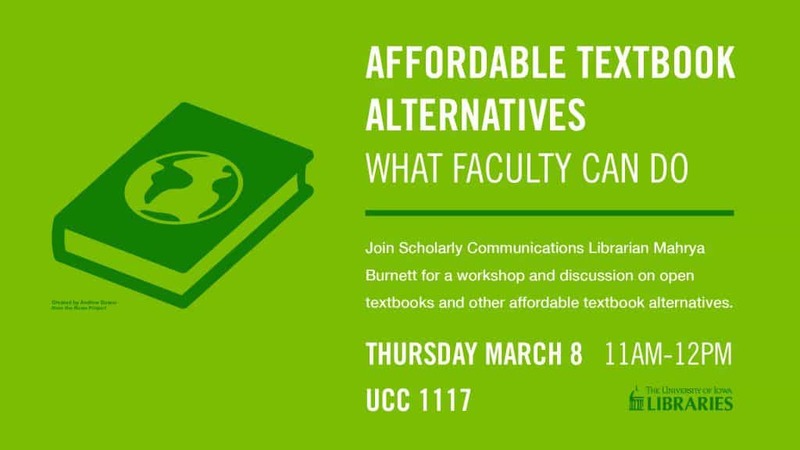 Scholarly Communications Librarian Mahrya Burnett will show you several open textbook repositories and discuss ways that you can lower—or even eliminate—student textbook bills. Join us from 11 a.m. to noon on Thursday, March 8, at University Capital Center 1117. The Midwest Chapter of The Medical Library Association (MLA) and Michigan Health Science Library Association joint annual conference is in Yipsilanti, Michigan this year. Our librarians are going to be busy! Heather Healy, Clinical Education Librarian and Mahrya Carncross, Scholarly Communications Librarian for UI Libraries will present Picture This! Teaching Ethical Use of Health Sciences Images, about updating the Images in the Health Sciences guide after the retirement of Hardin MD, lessons learned, and results from teaching with it. Matt Regan, Clinical Education Librarian, will present A Shot in the arm: fortifying an anemic institutional repository with faculty publication records. Jen Deberg, User Services Librarian, Matt Regan, and Heather Healy will Clinical Education Librarian, will present a poster Pure Collaboration: Supporting EndNote Sharing Options. The National Network of Libraries of Medicine, Greater Midwest Region (NNLM/GMR) located at Hardin Library will be sponsoring an Advanced PubMed program. 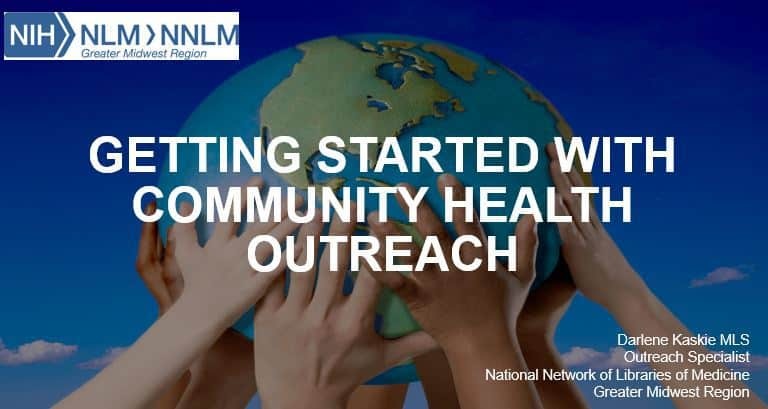 Darlene Kaskie, Outreach Specialist NNLM/GMR, will present Getting Started with Community Outreach. Jacqueline Leskovic, NNLM/GMR, will host the GMR Technology Topic on Virtual Reality. Linda Walton, Associate University Librarian and Director of NNLM/GMR and Elizabeth Kiscaden, Associate Director of NNLM/GMR will be presenting GMR Update. In addition, some of our staff provide service to Midwest MLA. Janna Lawrence, Deputy Director of Hardin Library, is Midwest MLA Representative to the Medical Library Association Chapter Council and is a member of the Midwest MLA Board. Elizabeth Kiscaden is chapter treasurer. Jen Deberg is recording secretary. Matt Regan is a member of the communications team. Set your clocks 1 hour forward on Saturday night/Sunday morning. History of daylight time and dates available online. 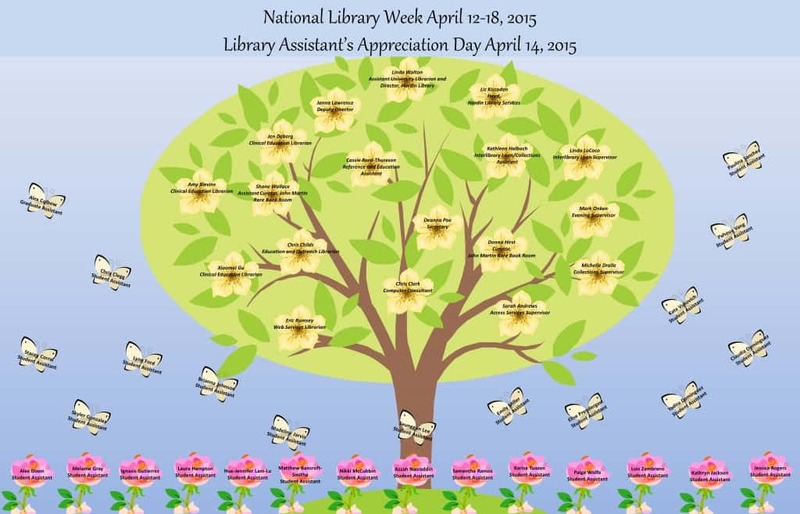 This year, National Library week is April 12-18, 2015 and National Library Assistants Day is April 14, 2015. This is a time to celebrate your local library personnel. Library staff members and student workers keep the library running by doing a wide variety of things like interlibrary loan, stack maintenance, circulation, etc. They also answer your questions. To help celebrate, we’ve put up a display in Hardin Library with the names of all of the people that work here. We’re also hosting a little contest. 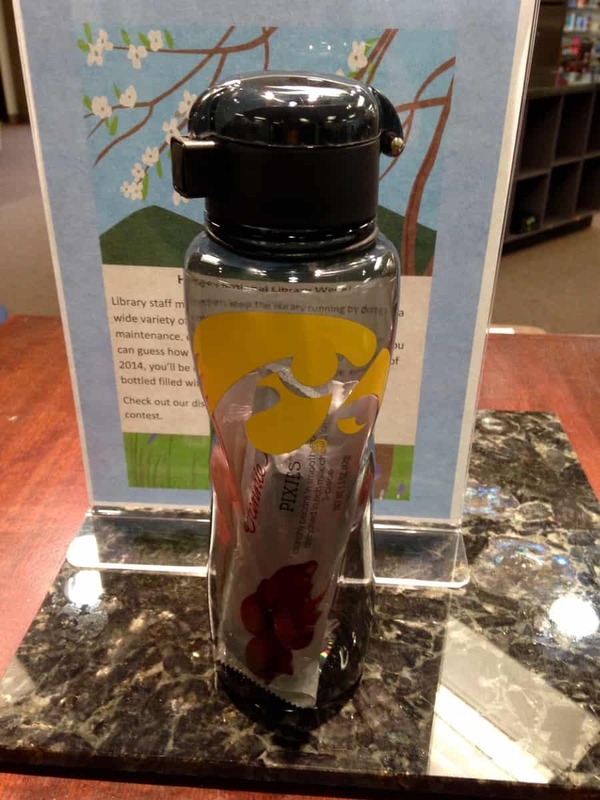 If you can guess how many questions were answered by Hardin Library staff members during April of 2014, you’ll be entered to win a fancy Hawkeye water bottled filled with candy. 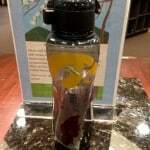 Check out our display for details on how to enter this contest. The display can be found on the 3rd floor of Hardin Library to your left as you enter the building. Embase, an important biomedical database, is now available for all University of Iowa users. 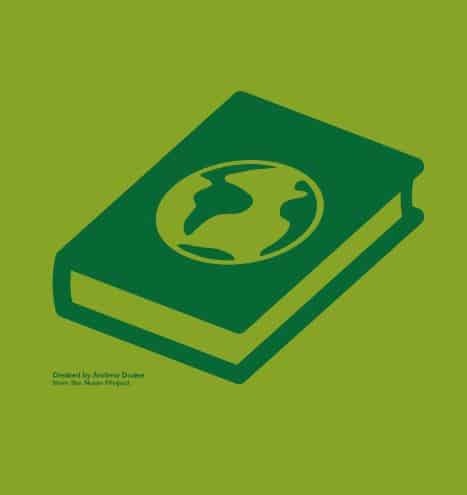 Sometimes called the “European MEDLINE,” Embase is another resource for supporting evidence-based medicine, the creation of systematic reviews, and, particularly, pharmacology-related information. Embase can be accessed from the Health Sciences Resources page. For assistance in searching Embase, contact your Hardin liaison. Daylight Savings Time begins Sunday at 2 a.m. Spring forward! 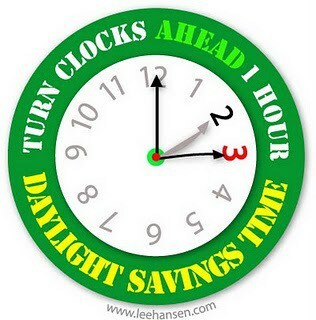 Daylight savings time begins this Sunday at 2:00 am. 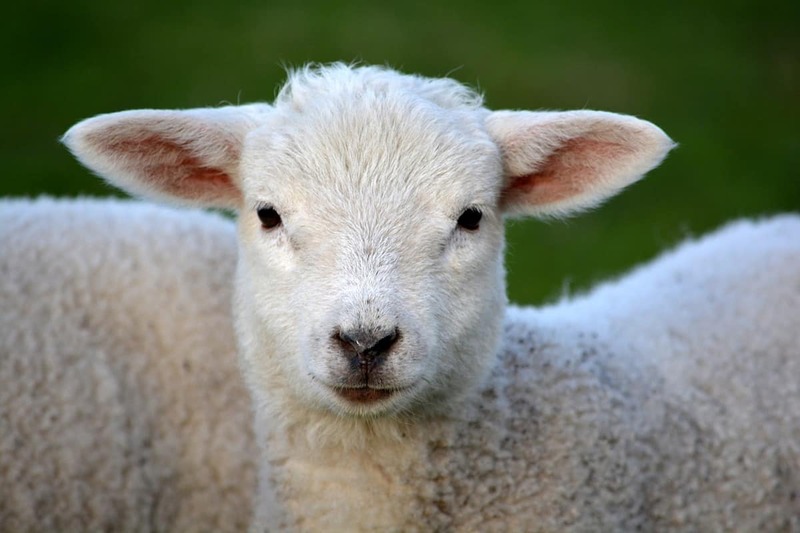 Set your clocks ahead one hour before bed on Saturday. The National Institute of Standards and Technology has more information about daylight savings time. Do you have NIH-funded grants? If so, this session, taught by Oliva Smith of the UI Office of Research, will show you how to use the NCBI My Bibliography module to manage citations of NIH-supported research publications, as well as look at how it is used in NIH RPPR electronic progress reports, as well as progress reports submitted on paper. This session will be held in Hardin Information Commons West on Monday, March 10, 2014, 1:00-2:30 p.m. To register, email Oliva Smith at oliva-smith@uiowa.edu. 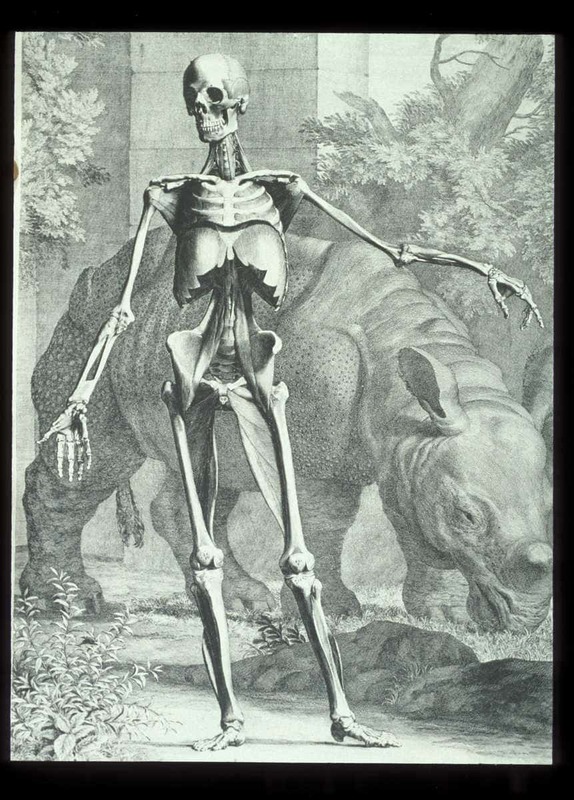 This work is perhaps the most monumental and finest anatomical atlas ever published. The plates, although probably derived from Vesalius, were drawn with painstaking accuracy by Wandelaer and are dated between 1739 and 1747. Albinus described in his preface the methods used in the drawing of the skeletons and “muscle men” to achieve symmetry and beauty in each figure. 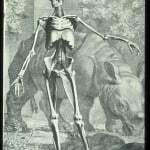 All of the skeletons and “muscle men” have lush background scenes taken from nature which were chosen to animate the figures and emphasize the harmonious and natural beauty of the human body. The first three plates of the skeleton are each accompanied by outline plates. The following nine plates of the “muscle men” also have an additional outline plate. The final sixteen plates represent individual muscles and parts of muscles and each of the many figures is supplied with an outline drawing unless the letters are engraved directly on the finished figures. The transition from Hippocrates’ humors and Galenic dogma to microscopic causes of illness was a long and distressing experience delaying for centuries the concept of contagion. Manifestations of scabies infestations were attributed erroneously to systemic phenomena, even digestive disorders. This lecture will present a 2,000 year review of this wholly human parasite that spread in ‘deep time’ to numerous animal species as variant subspecies.